The bed was comfortable, the owners were like family, and it was centrally located to the harbor, bus station, and restraunts. Location was great. There was a restaurant that played traditional Greek music right outside our window which was lovely, but shutting the windows provided good soundproofing so we slept well. Hosts were lovely and helpful. Everything. The RO was squeaky clean, had small treats in the kitchen and mostly homemade/fresh items. From our room there was access to a huge private balcony enough to fit us and a few friends. Very pretty, very neat and the location was simply perfect. You step outside, 30" later you are at the Port. Amazing value, which the very friendly and sweet owners make even better. Great people. Lots of love. Feel like home away from home. Host family welcomes me as if I am a member of family taking me to boutique showing traditional Cretan cloths and carrying my big suitcase to the bus station. Room was neat with small kitchen enough for making Greek salad and tzatziki. Private balcony makes me relaxing enjoying Greek beer and olives + home made Raki from the family. The best I ever stayed. Xania and Costa were the best hosts we had from all the 4 places we stayed on our Greece vacation. Every day they had a little surprise for us and the kids, like traditional Greek sweet bread, cheese bread, and homemade liquor and orange jam. They booked us an airport transfer with a van that worked perfectly for us. The house was a great size for our family of 4 and was in a great location. Right in downtown of Chania near the pedestrian area. Lots of restaurants near by. 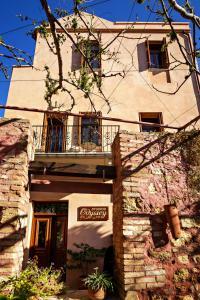 Walking distance to a mini market and bakery. We highly recommended ! Very beautiful old building in the most beautiful part of town. Hosts were amazing! The location was IDEAL a very short walk from the harbor but tucked away in a corner so you aren't awaken by the nightlife greeks and Americans! Great location is a historic house, nice neighborhood, delightful owners. This place is amazing, and the hosts make it extra special. We loved the treats when we arrived, and they are so warm and welcoming. The balcony overlooking the restaurant with live music is really nice in the evenings. Also really liked the eco-friendly air conditioning - wouldn't function unless all the windows and doors were latched! Perfect stay! 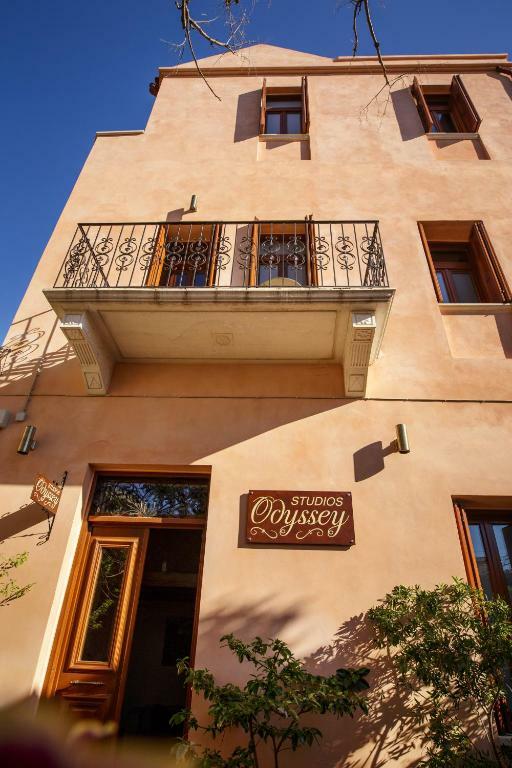 Lock in a great price for Odyssey Studios – rated 9.7 by recent guests! 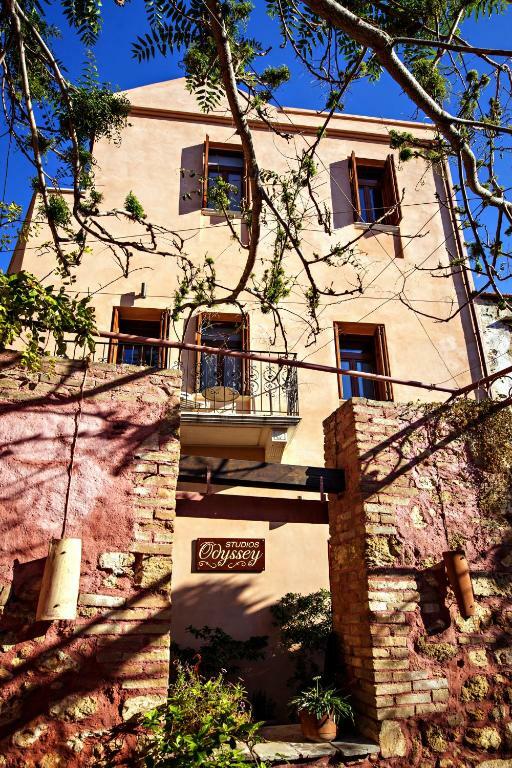 One of our top picks in Chania.Housed in a restored 100-year-old building, Odyssey Studios are located in a quiet pedestrian street in the heart of Chania. Free WiFi is provided throughout the property. 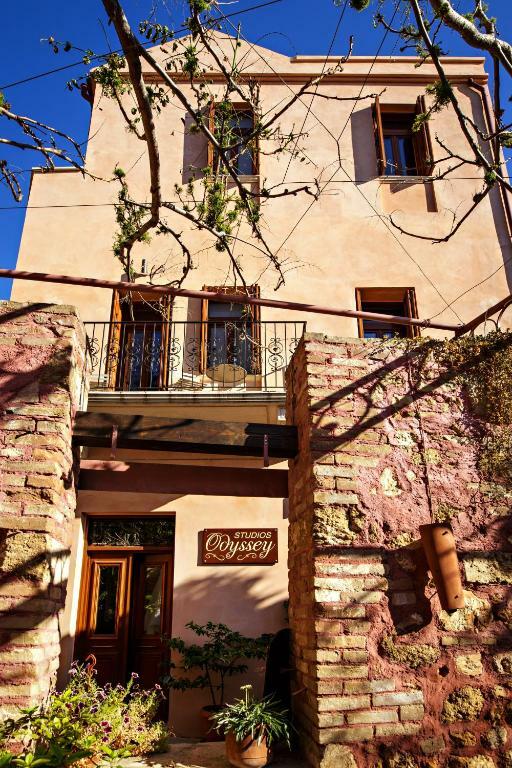 Odyssey Studios are split into 2 spaces and open to a sunny balcony or veranda. Each studio features a kitchenette with fridge, cooking hobs and electric kettle. Bed linen and towels are provided. Municipal Market of Chania is 650 feet from Odyssey Studios. Chania International Airport is 6.8 mi away. 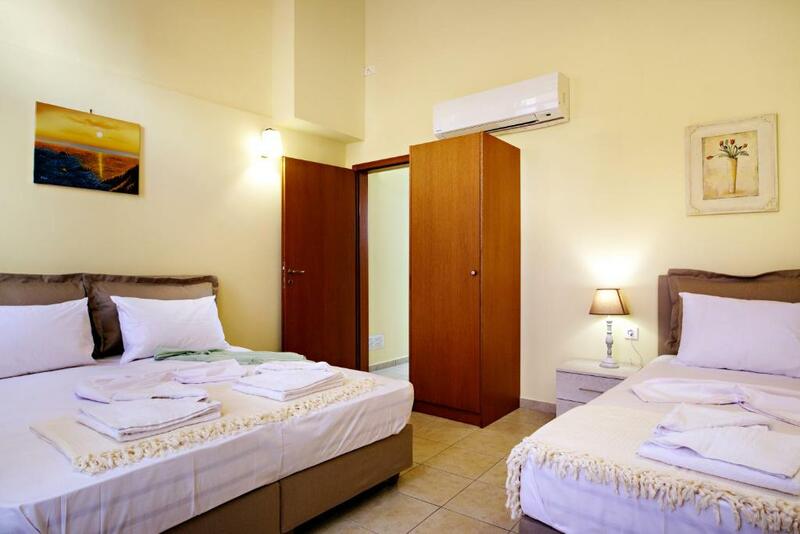 뀐 Located in the real heart of Chania, this property has an excellent location score of 9.8! When would you like to stay at Odyssey Studios? This apartment features a stovetop, tile/marble floor and seating area. This apartment has a private entrance, soundproofing and kitchenware. This apartment features a kitchenette, balcony and air conditioning. 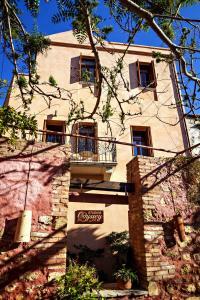 ODYSSEY STUDIOS is a neoclassical building from 1901, located on a pedestrian street just 80 meters from the Venetian harbor of Chania. It was restored according to the archaeological service. In the center of the building dominates an elaborate wooden staircase. The building is on three levels, it has an internal private courtyard with tables and chairs where the visitor can enjoy his meal. On the terrace there is a private patio overlooking the White Mountains. All studios are two-room living / dinning room with their kitchen and bedroom. In the kitchen there is a fridge and kitchen utensils for preparing meals. A cooling / heating aircondition is provided in each room, a 22-inch plasma-screen satellite TV and free WIFI. The bedrooms are fully equipped. Beach towels are provided. House Rules Odyssey Studios takes special requests – add in the next step! Odyssey Studios accepts these cards and reserves the right to temporarily hold an amount prior to arrival. Please inform Odyssey Studios of your expected arrival time in advance. You can use the Special Requests box when booking, or contact the property directly using the contact details in your confirmation. Please note that check-in and key collection take place at: DESPOTAKI MELCHISEDEK 35, CHANIA 73100. The studio apartment was small. Complimentary super delicious homemade kumquat raki and marmalade are to die for! Xenia and Costas are amazing warm hospitable hosts! Gorgeous building and it's been restored very well. The studio we stayed in is very spacious for both of us. It's located quite central to everything, in a cute small lane/road, opposite a taverna with live music. Our room has a balcony facing the taverna and we enjoyed many nights sitting on the balcony enjoying the homemade raki with the live music! Thank you Xenia and Costas for making our stay so memorable. We will be back! The location and building were stunning. The balcony was amazingly relaxing. Lovely hosts, great rooms, we stayed in the top floor room with the terrace for 2 nights and returned for 1 further night in the room with balcony overlooking a great restaurant, lovely to sit out and listen to the music. The rooms are lovely, very clean and great beds, the location is fab just a 5 minute walk to the harbour and 10 minutes to the bus station. Lovely treats in the fridge and a wee gift when we left. Will be back and definitely stay in the odyssey and recommend it to friends. In Crete, we can through toilet paper in the toilet. There is a bin and we always have to use it. This is not only this hotel, it is all properties. I was not get used to it. The hotel was more than I expected.The location is wonderful. The street was smell of flowers. It is in front of a beautiful Crete restaurant which has live music. So we enjoyed the music at our Balcony for free! The owner is always available and helpful. There are welcome drink, bread and jam. It is more than we paid!! The hosts were charming and interesting, it was like meeting friends. Lovely apartment with all you require and little extras in the fridge. Quiet but in a great location for everything. We hope to return. The best location in Chania's old town. Beautiful spacious appartment. Xenia is an amazing host and lovely person :) We loved homemade marmalade and raki and warm pie that we found in the morning. In the evening we have sat on our balcony and listened to nice greek music, nearby. Bathroom was one of the smaller ones we've encountered in Greece/Europe. We asked for our room to not be cleaned in order to have more privacy but they ignored the NO cleaning sign I put on the door handle, as asked. Amazing hosts! Industrious, cultivated and very well organized, they were waiting for me with the keys, a map of the main sites in Chania, a practical Greek glossary, answers to all my questions, a booklet with proposed walks through the city's historical sites... The studio was cozy, super clean, maintained as new, provided all the amenities listed on the website and more. The hosts also offered home-made jam and kumquat liqueur, bread and various types of coffee, plus all kitchen essentials. 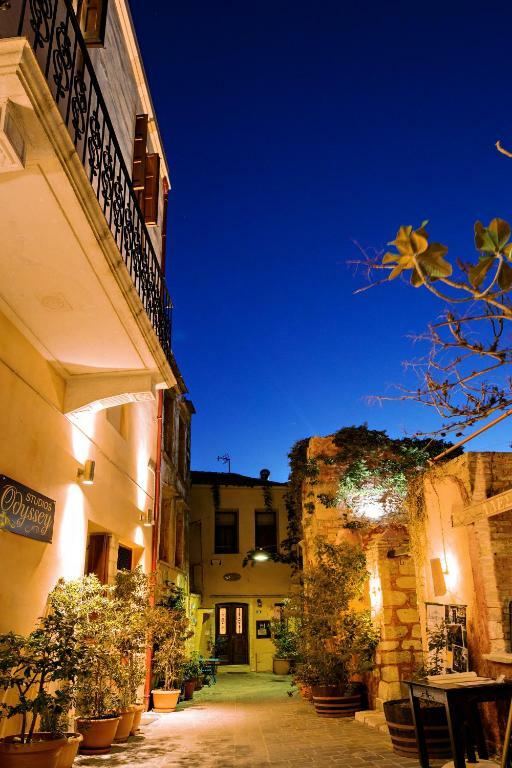 Odyssey is in the heart of historical Chania with all the comforts of today. A coup de coeur! The place was in the centre of Chania - very close to the old harbour and main streets of Chania. The owners were very hospitable. Wonderful place to stay... Excellent value for money.